The AMD alternative? A quad-core CPU, Crossfire graphics and plenty of memory - the HP Pavilion 15 offers a lot for less than 500 Euros (~$663). But how competitive is AMD's new platform and does the inexpensive 15-inch notebook offer any surprises? The recent hype about Intel's latest Haswell processors almost lets you forget that AMD also introduced a (more or less) new platform called Richland a few months ago. 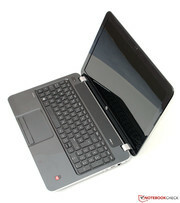 Although the product variety is still comparatively limited, some devices, usually with low price points, are available. 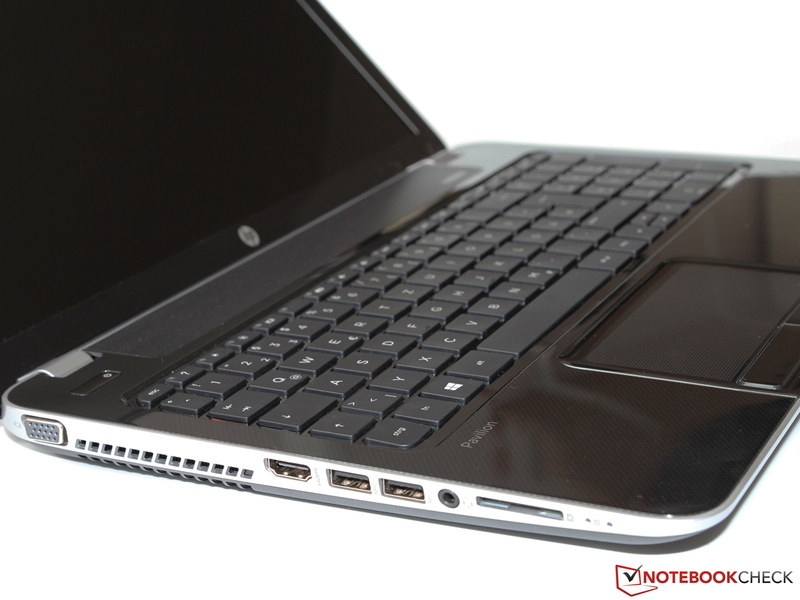 HP has traditionally a close relationship with AMD and introduces two notebooks at the same time. Besides the Pavilion 17, there is also the smaller Pavilion 15, which is also our review unit. 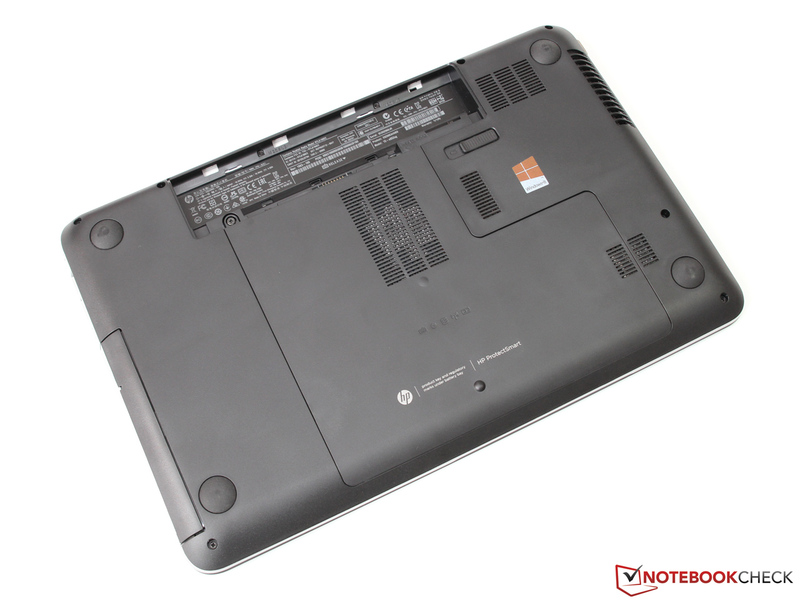 You get a well-equipped device for a price of almost 500 Euros (~$663): The quad-core APU A8-5550M is supported by 6 GB memory and a 500 GB hard drive; HP also integrated the dedicated graphics card Radeon HD 8670M. This can be combined with the integrated processor graphics - we are curious if the performance has been improved compared to the predecessors that had problems with micro stutters. 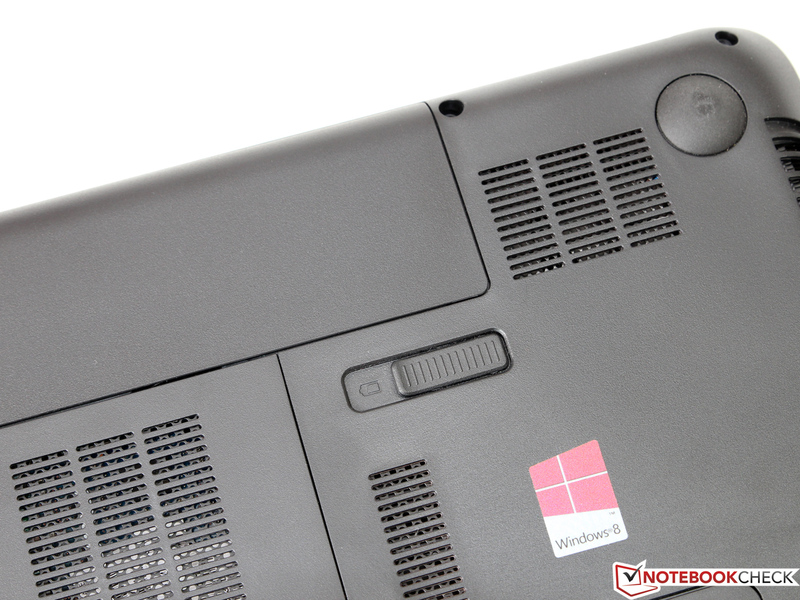 Competitors for the Pavilion 15 are simple Core i3 notebooks like the Acer Aspire E1-571G, but also some especially inexpensive Core i5 devices like the MSI CX61. 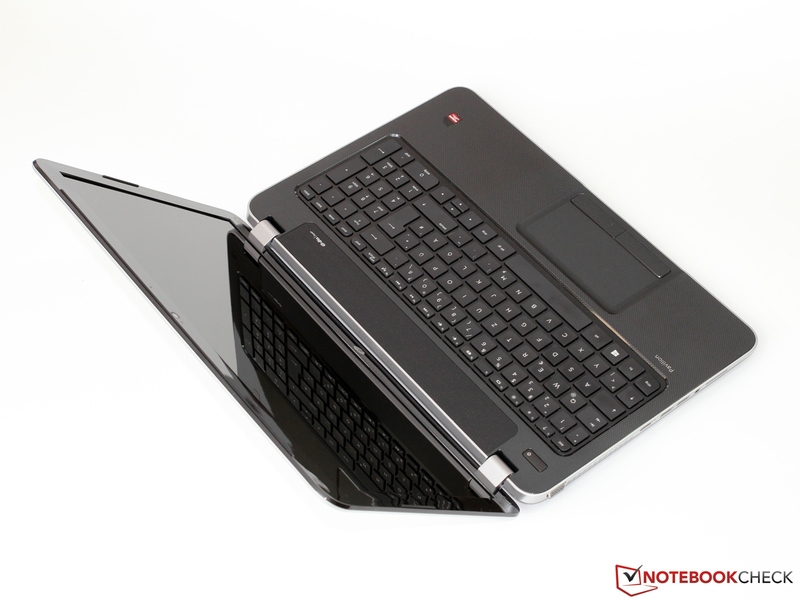 Which notebook offers the best overall package for a small price? Unfortunately, HP once again uses a glossy plastic case. The smooth surfaces really attract fingerprints; if you really want to enjoy the black-silver design, you will have to clean it on a regular basis. Once it is clean, it also leaves a high-quality impression and suggests a considerably higher retail price. At almost 2.4 kilograms (~5.3 pounds) and a thickness of around 3.2 centimeters (~1.3 inches), the Pavilion 15 is not as thin as some competitors with ULV processors, but it is still mobile enough for the occasional transport. The stability is also average: Resistance against concentrated pressure is limited, however, this is certainly not a serious drawback. The overall build quality of the notebook is actually on a surprisingly high level for this price range - even the details are very sophisticated. Display hinges usually tend to be a weakness with inexpensive devices, but our review unit leaves a solid impression in this regard. 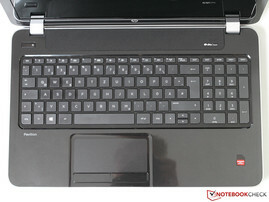 You cannot open the display cover with one hand, but the firm hinges also prevent annoying display bouncing. The torsion resistance of the device is also on a good level, despite the lack of expensive materials. 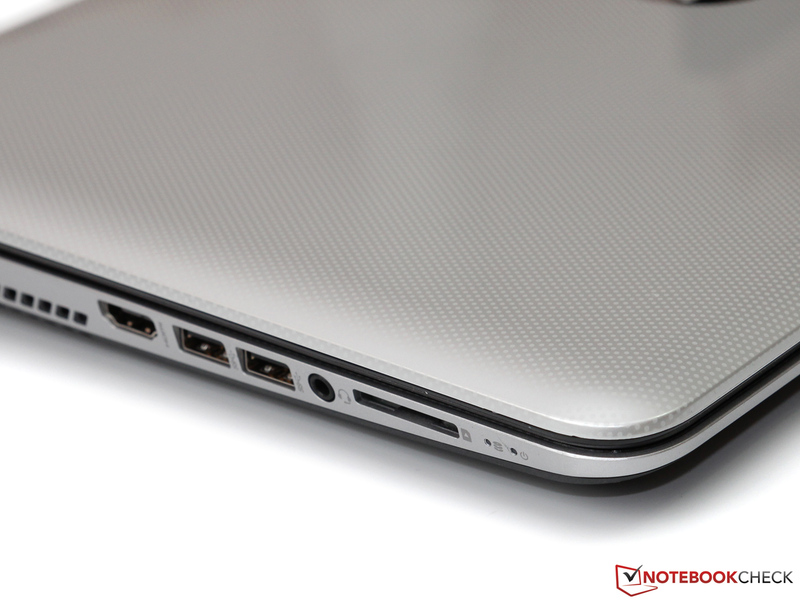 One of the most important ports of modern notebooks is certainly the fast USB 3.0 standard and the Pavilion 15 has two of them. Combined with another USB 2.0 port the user has sufficient ports to attach different peripherals. However, we do not like the manufacturer's decision to only integrate HDMI as well as an analog VGA port instead of a modern (mini) DisplayPort. The outdated Fast-Ethernet port is also an indicator of the low price point - similar austerity measures can also be found at the competition. 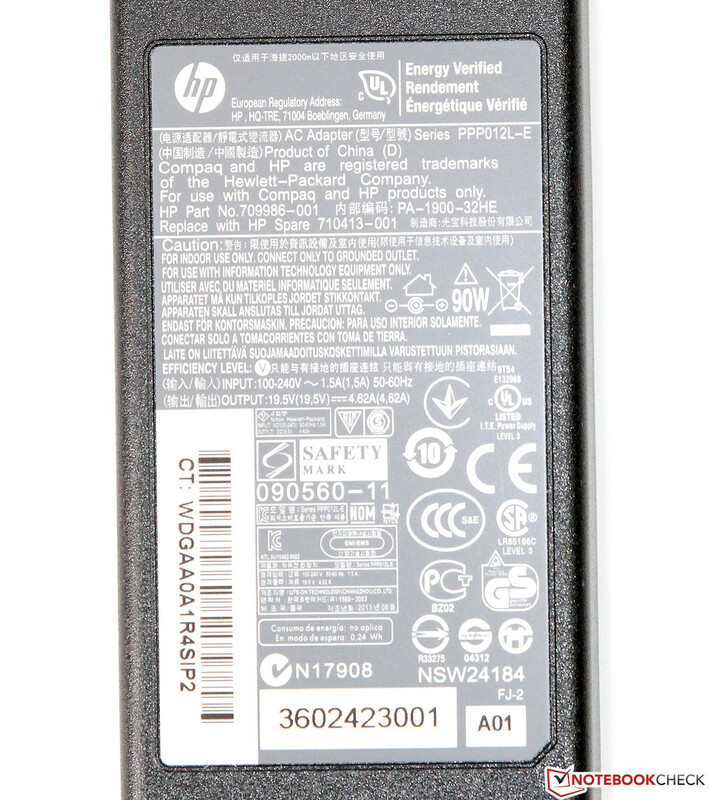 The layout of the mentioned ports is tightly packed on the left and right hand sides. USB ports, card reader (SD/MMC) and stereo jack are easy to reach at the front area, but are almost too close to each other. Due to the lack of Bluetooth and UMTS/LTE support, the Pavilion 15 can only use wireless networks (IEEE 802.11 b/g/n). The according Realtek RTL8188EE module only supports single band (2.4 GHz) and single stream (maximum of 150 MBit/s), which should not be a huge problem in most scenarios. Our tests showed that the performance is actually quite good and consistent in short and medium distances. Bigger distances or massive obstacles on the other hand resulted in a significant performance drop. Your expectations for the Truevision HD-Webcam should not be too high; videos of the 1.0 megapixel camera are not very rich in detail and have problems with picture noise in dark environments. The quality is only sufficient for simple video calls; the sound quality could also be better - voice recordings are usually understandable and you do not need an additional headset. Except for the notebook along with the battery and the 90-Watt power supply unit, there are no additional accessories in the box of the Pavilion 15. HP even waived a driver or recovery DVD - you will have to create them on your own with the preinstalled software (HP Recovery Manager). However, we also have to give HP credit for the lack of annoying trial versions and advertising applications. After the removal of the battery and loosening of one screw, you can remove the maintenance cover with a simple sliding mechanism. 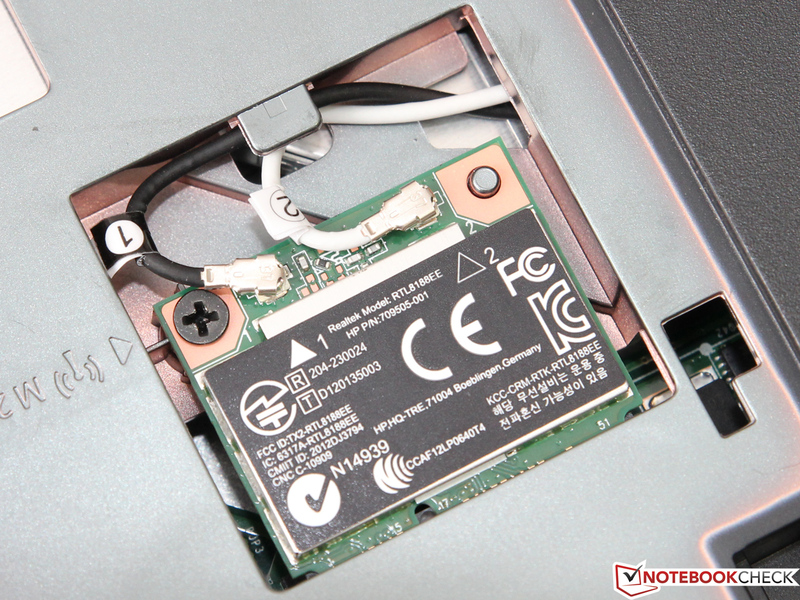 After that, you have access to the two memory slots, one 2.5-inch hard drive bay as well as the WLAN module. 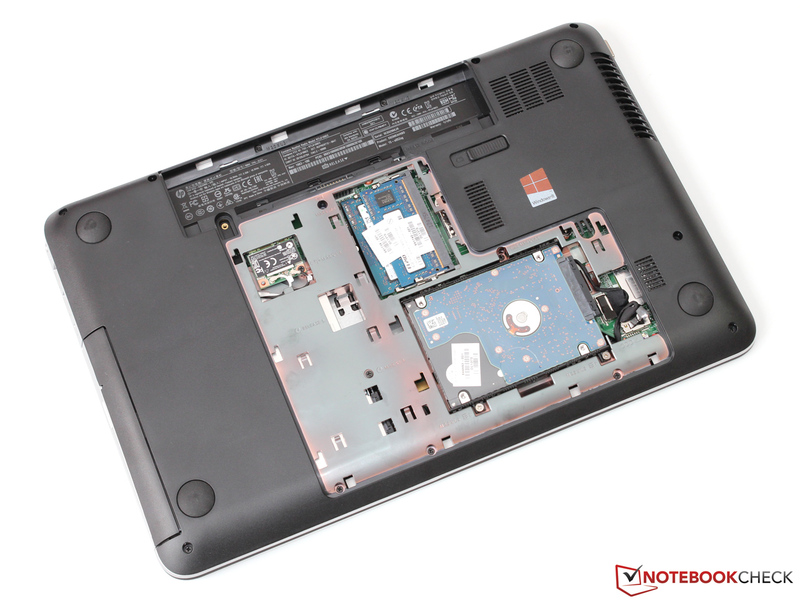 All slots are occupied ex-works, you will have to replace the components if you want to upgrade your notebook. Cleaning of the fan is even more complicated since you will have to disassemble the whole device. 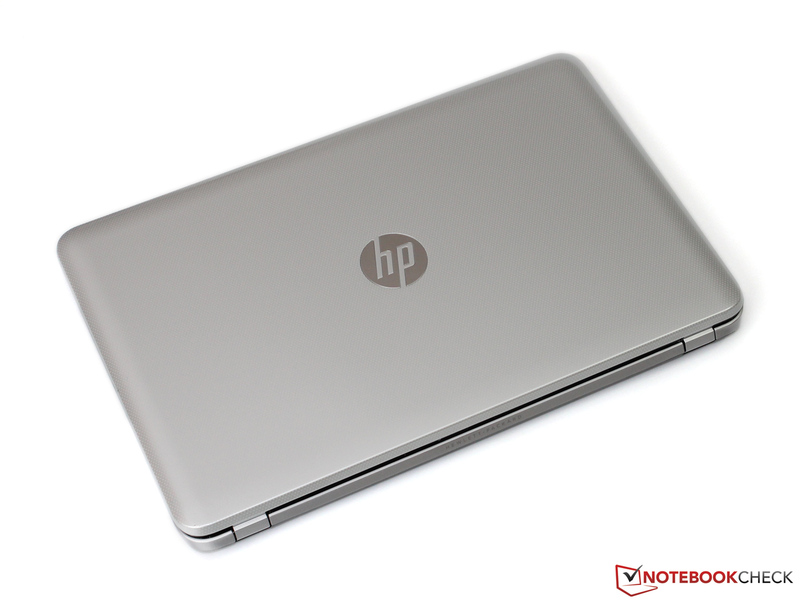 Although HP advertises the Pavilion 15 as carefully checked and completely reliable, the confidence in their own product does not seem to be very big: A meager 12-month warranty meets the low standard of this price range. At least you can extend the warranty to 24 months for 58 Euros (~$77, 3 years 94 Euros/~$125); the additional charge is reasonable. 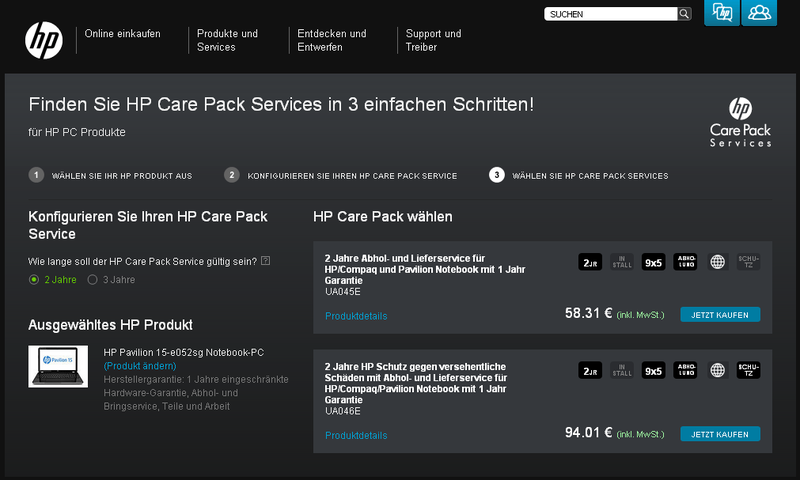 The associated Care Packs can be purchased in HP's online shop. 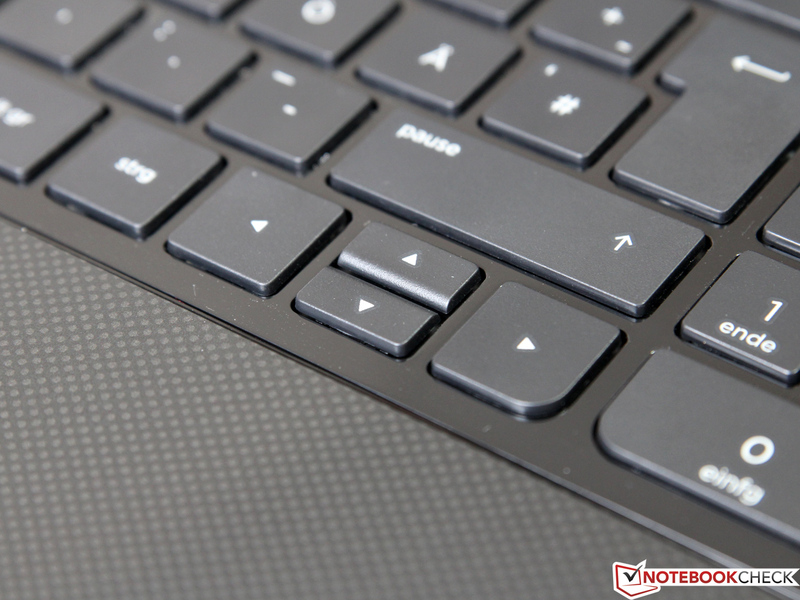 The chiclet-style keyboard does remind us of input devices of older Pavilion notebooks. While we like the clear layout and the additional numeric keypad, some users might struggle with the cheap plastic impression and the small arrow keys. More important than these details is definitely the typing experience. Although the stroke is slightly too soft and the travel is too short, we got used to the very stable keyboard (even in the center) after some time. Another positive aspect is the very low noise development, which does improve the formerly mentioned cheap impression of the material. 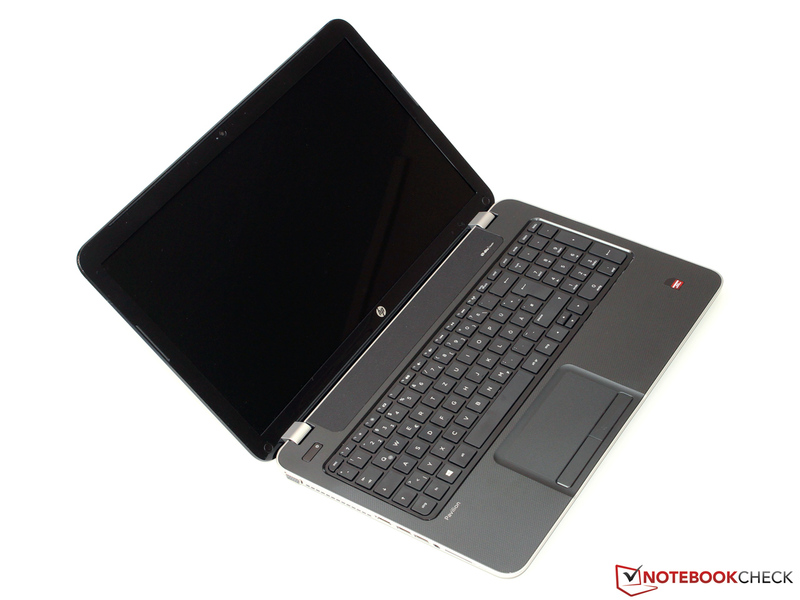 HP decided to integrate a well-known input device from the touchpad specialist Synaptics. The slightly lowered but seamlessly integrated touchpad has a structured surface with generous dimensions of 10.7 x 5 centimeters (~4.2 x 2.0 inches). Even multi-touch gestures with three fingers are very comfortable. 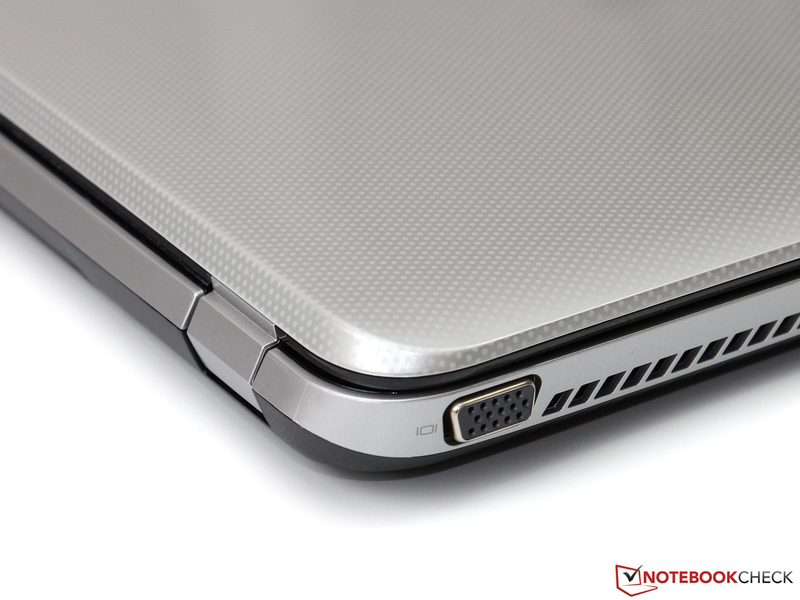 Combined with the excellent precision and a well-defined haptic feedback, the Pavilion gets a good rating. 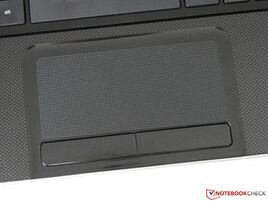 The two mouse buttons below the touchpad cannot continue this good impression. The precision in the peripheral areas is a bit spongy and both buttons have problems with occasional clatter. 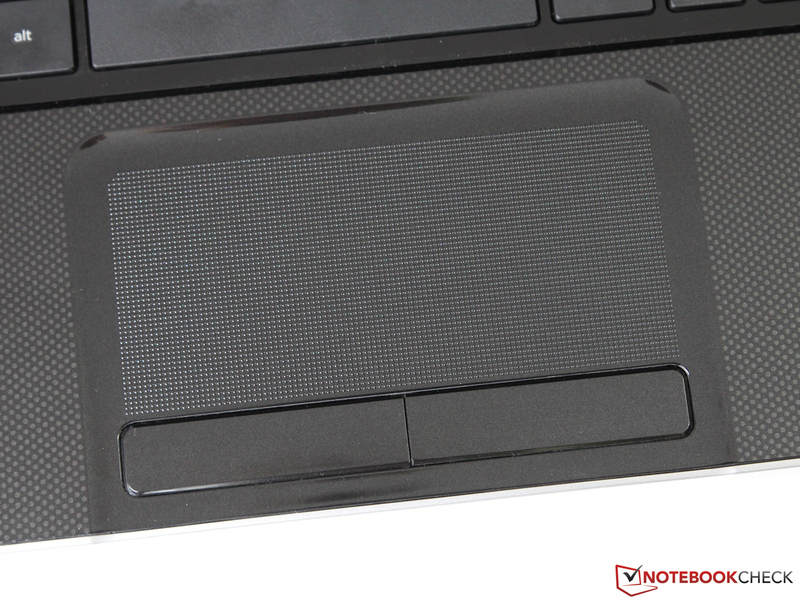 However, we would always prefer this solution to most click pads with integrated mouse buttons. 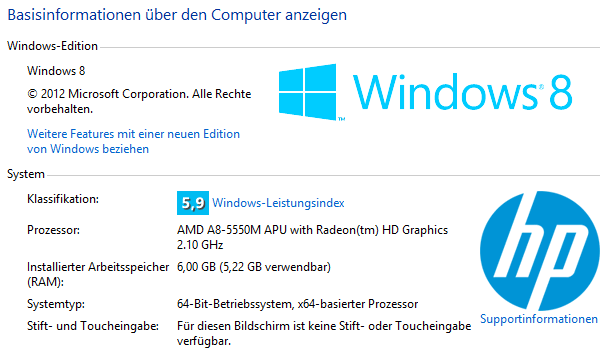 You cannot really expect a high-resolution high-end display in a multimedia notebook for less than 500 Euros (~$663). 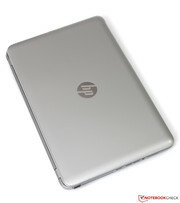 The 15.6-inch display with a resolution of 1366x768 pixels is therefore standard for this class. Older users will appreciate the good visibility of texts and symbols, but other users will want a higher pixel density than the 100 ppi and more space on the desktop. The frugal LED display backlight is a common feature for many years now. The Pavilion has a very even brightness distribution of 87%, but does not convince in terms of maximum display brightness - we only measured 201 cd/m² on average, which is similar to the competitors from Acer and MSI, but it is not always sufficient even in bright indoor environments. 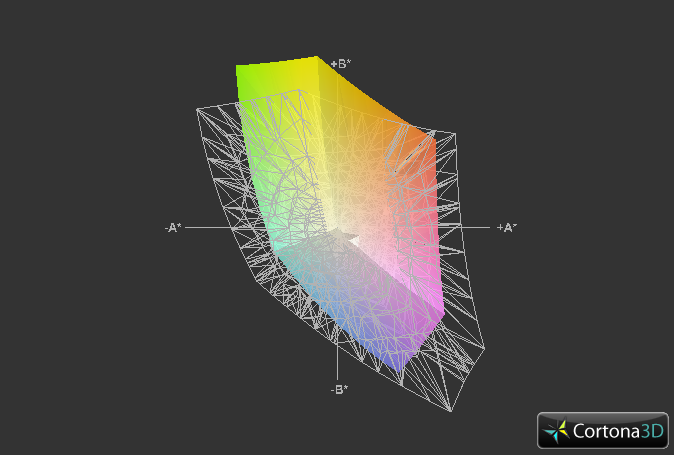 The TN display is provided by LG Philips (LGD0384); it has a good black value of 0.34 cd/m² and contrast ratio of 615:1. 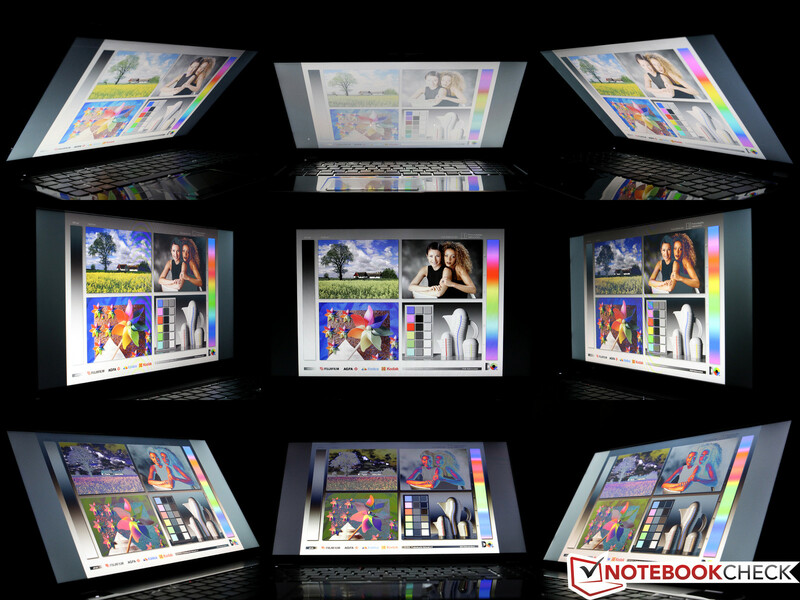 Subjectively, the display also benefits from the glossy surface that results in a vibrant and vivid picture. However, the vibrant colors are more illusion than reality: Similar to almost every consumer device is the very limited color space coverage and mediocre color accuracy. 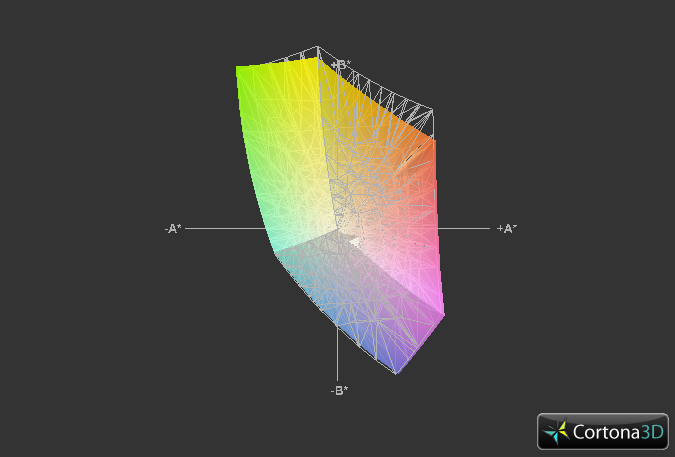 We can see that some colors are shifted towards blue, even without a reference display as a comparison. As a result, the picture appears too cool; the average color deviation is 6.2 (DeltaE). We already mentioned that the glossy display of the Pavilion 15 is certainly not one of the brightest. This creates two problems outdoors: Annoying reflections are always present, even in the shade (albeit in a weaker form). 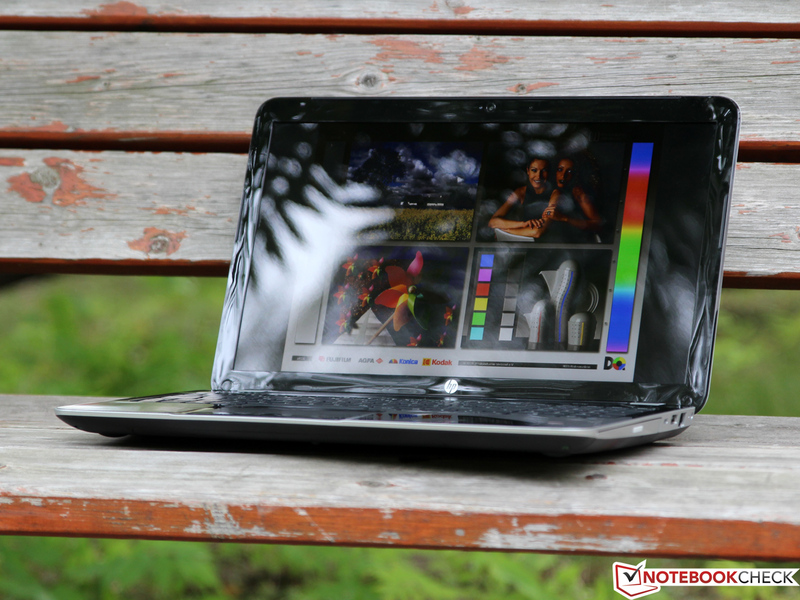 You can obviously use the notebook outdoors, but other devices are better suited for this scenario. Typical for a TN panel are the limited viewing angles; you only get an unimpaired picture at a completely vertical viewing angle. Even small vertical deviations result in a reduced contrast ratio and heavy color deviations. This effect is also visible with horizontal angles above 30 degrees - not really the best conditions for movie playback with friends. The latest Richland generation is the successor of the Trinity APU. AMD did not really change the architecture itself, but focused on improving the Turbo clocks. Compared to the old A8-4500M (1.8 - 2.8 GHz), the clocks of the A8-5550M – the second fastest Richland chip after the A10-5750M - were slightly raised to 2.1 - 3.1 GHz. The quad-core chip is still produced in a 32 nm manufacturing process by Globalfoundries; AMD specifies the TDP with 35 Watts. 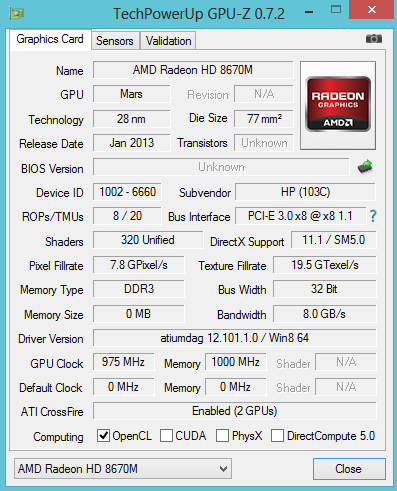 Similar to any modern mobile processor, the A8-5550M also has an integrated GPU; the designation is Radeon HD 8550G. HP also integrates the dedicated Radeon HD 8670M, which can also be combined with the integrated processor graphics for a Crossfire solution. 6 GB DDR3-1600 RAM (2 GB Hyundai, 4 GB Elpida) inside the Pavilion 15 should be sufficient even for more complex applications, which can be stored on the internal 500 GB hard drive. The optimizations of the new Richland chips seem to be insignificant, but that is not the case: Contrary to Trinity chips that could never utilize their full Turbo potential, the A8-5550M shows an improved behavior. 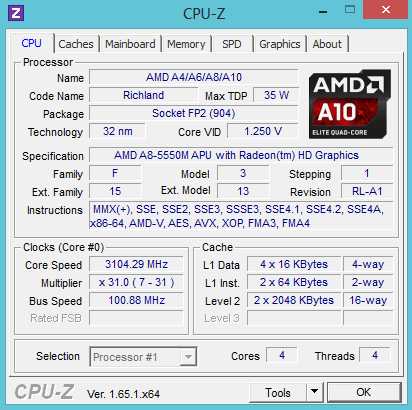 We can see that the clock fluctuates around 3 GHz in single thread applications, which enables a Cinebench R11.5 score of 0.78 points. Our review unit can actually beat the alleged top version A10-4600M (0.74 points), but is far behind a comparable Intel CPU like the Core i3-3110M (around 1.0 point). The situation is slightly better in multithread scenarios, where all four processor cores of the modular architecture can be stressed. Although the clock drops from 2.8 to 2.4 GHz after 20 seconds, the AMD chip gets closer to the Intel competitor. 2.06 points are less than 15% behind the i3-3110M (2.4 points) - the difference is hardly perceptible. 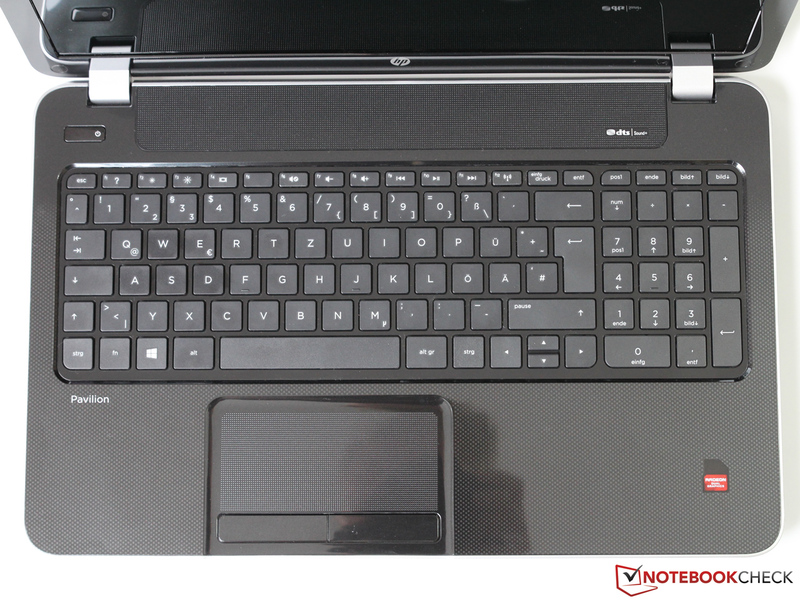 Our review unit is equipped with a conventional 2.5-inch hard drive from Hitachi's Travelstar-Z5K500-series. 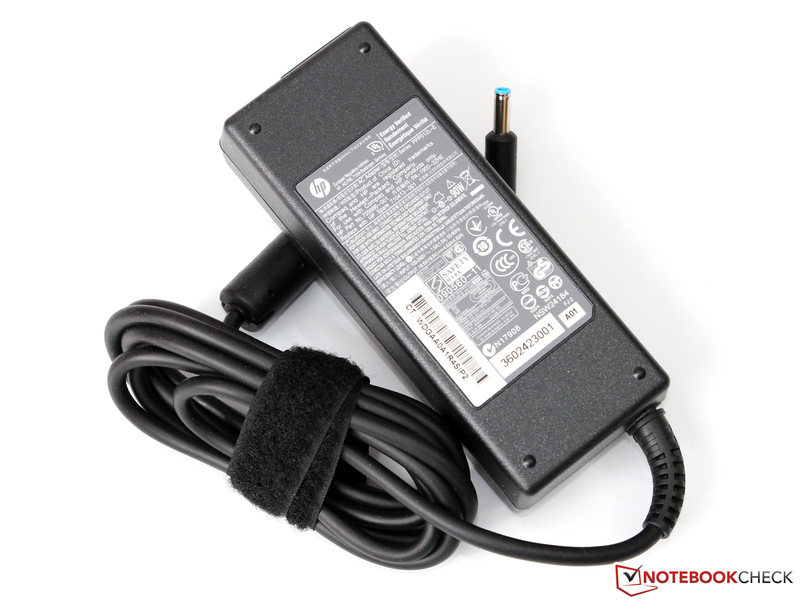 It uses the SATA-II interface and is certainly not the one of the fastest solutions with its 5,400 rpm. The comparatively high data density does however provide reasonable transfer rates that do not have to hide behind the competition. The average transfer speeds (read and write) are around 87 MB/s and the average access time is 18.3 milliseconds (HD Tune). If you need more performance and you are willing to pay the additional price for an SSD, you can find more information in the Maintenance section. We always use Futuremark's PCMark benchmarks to determine the overall system performance. The results especially benefit from fast processors and hard drives and the Pavilion 15 shows the expected gap to competitors with Core i3 and Core i5 processors from Acer and MSI. However, they are still on a comparable performance level. The performance is more than sufficient for daily tasks anyway, and even more complex scenarios like simple picture and video editing are no problem. However, you should not be fooled by the term quad-core CPU - the A8-5550M cannot compete with more expensive Core i7 quad-core CPUs. 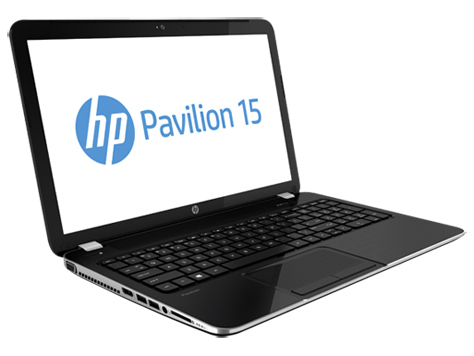 The Pavilion 15 has a very powerful graphics solution according to the specifications. In addition to the 256 shader units of the integrated Radeon HD 8550G (515 - 720 MHz, shared memory) there are 384 units from the dedicated Radeon HD 8670M (975 MHz, 1 GB DDR3-RAM with 64-bit interface). The theoretical performance can even surpass many high-end solutions. The real world performance of the combined graphics on the other hand does suffer from the limited memory interface and the not quite perfect Crossfire scaling. However, the 1,947 points in 3DMark 11 (Performance) are still reasonable and can compete with Nvidia's GeForce GT 740M. 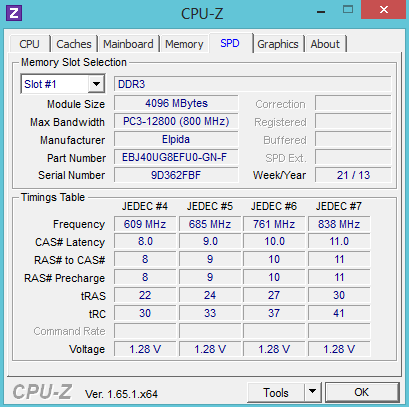 Unfortunately, Crossfire does not always work in the synthetic benchmarks. We could not determine any performance improvements over the single Radeon HD 8670M in 3DMark (2013). Problems with the Crossfire solution are also no exception in games. We cannot see improved frame rates in many games, the performance is even worse in some titles, for example Crysis 3. 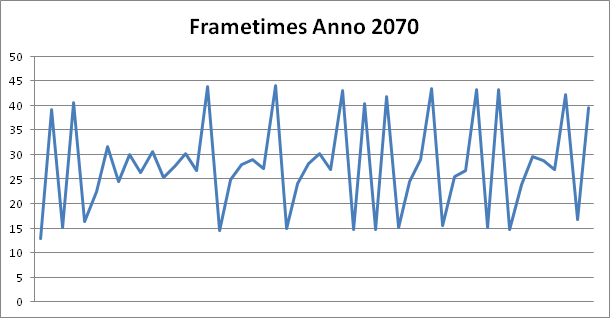 There are also noticeable micro stutters, they are still perceptible in Anno 2070, for instance, with more than 40 fps. Driver updates can perhaps improve the situation - but do you really want to risk that? All things considered, the Dual Graphics solution is still more illusion than reality - not a very good result for a two-year old technology. 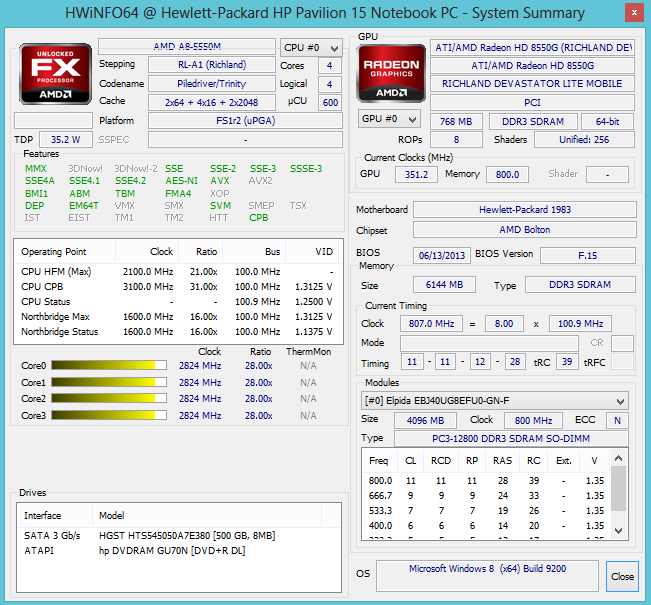 HP should have waived the dedicated GPU and integrated the faster A10-5750M in our opinion. This would not only have been more efficient, but maybe even the cheaper solution. HP did a good job in regard to the cooling solution. The fan is hardly audible during idle with 30.3 up to 32.2 dB(A) and does not get much louder with daily tasks. 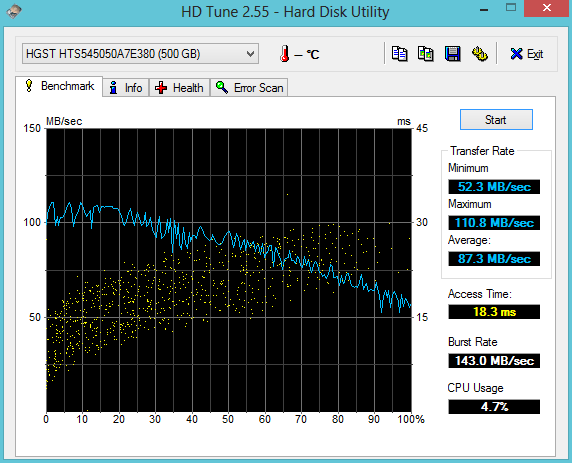 Only the DVD-drive is somewhat annoying with 38.8 dB(A). The situation changes under load: The fan speed is increased step by step and results in 46.1 dB(A), but we only reach this extremely high value in our stress test. The system noise is still reasonable in games with around 42 dB(A), even though competitors like the Acer Aspire E1-571G are quieter with 37.7 dB(A). 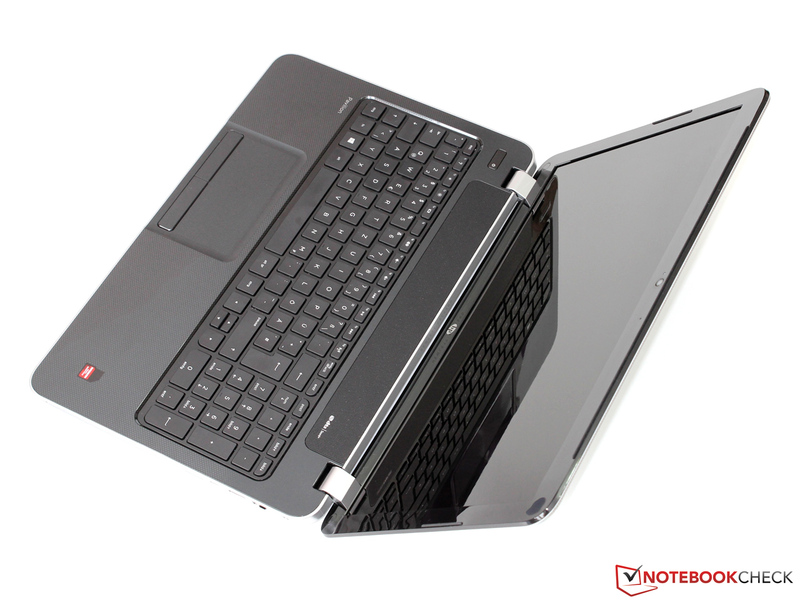 The notebook is not only very quiet during idle but also very cool. We measure an average surface temperature of around 27 °C (80.6 °F), which shows the efficiency of the several energy-saving features. The temperature increase under load is limited to the fan area and does not really affect the user. Our stress test (Prime95 and Diablo 3, FurMark did not work) has a bigger effect on the hardware inside the case. While the graphics card reaches 70 °C (158 °F), we can measure up to 77 °C (170.6 °F) for the CPU. However, these values are not critical by any means and we could not determine any throttling issues. 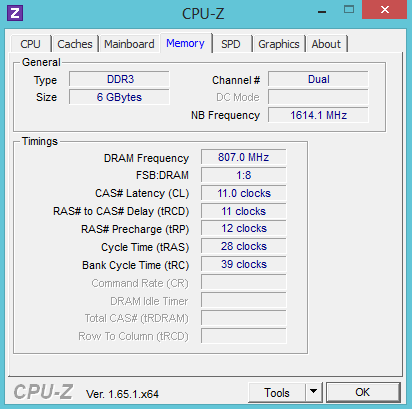 Even the Turbo does occasionally work and raises the processor clock up to 2.4 GHz. 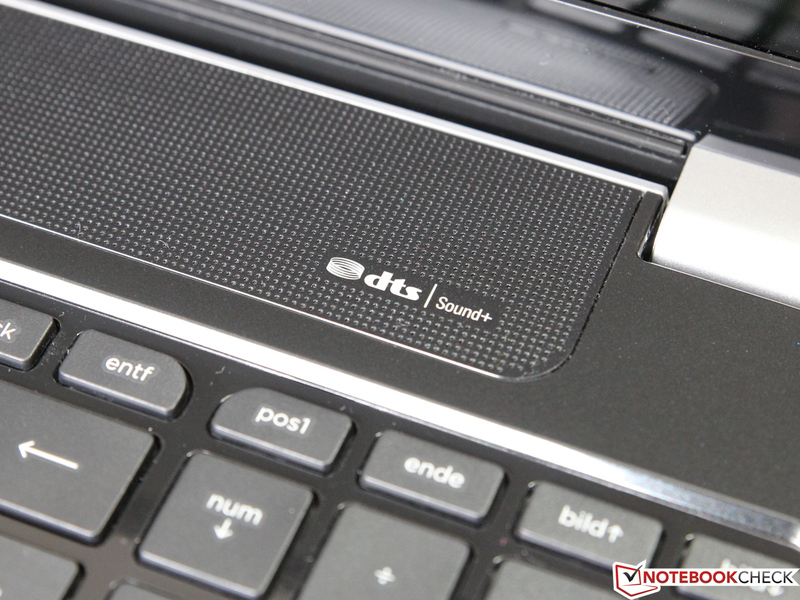 A small DTS sticker advertises the stereo speakers above the keyboard and the sound quality is average. Although we would like a more powerful (or any) bass, the sound is very precise, spatial and sufficiently loud. However, we recommend a real sound system via HDMI or stereo jack for movies, music or games. 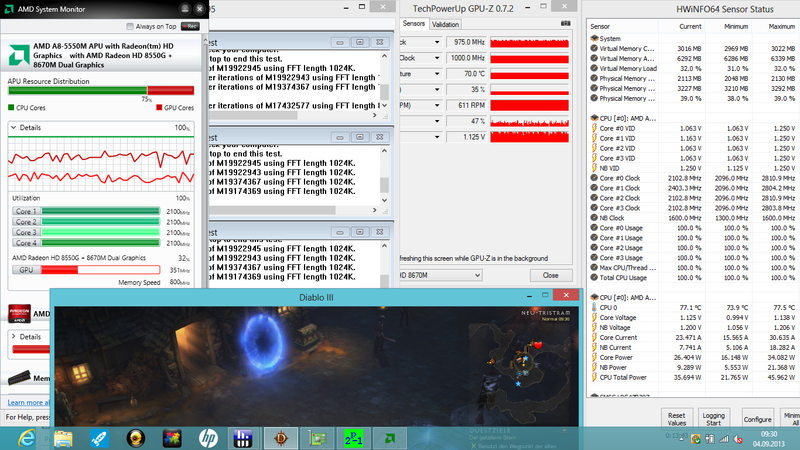 Thanks to the dynamic GPU switching, the energy consumption during idle is very low. 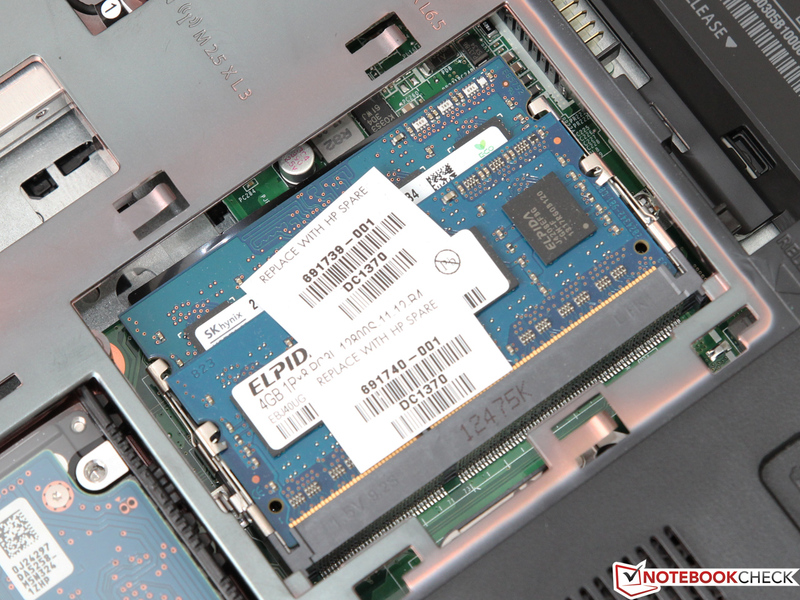 Between 7.3 and 12.5 Watts are very frugal for a big 15-inch notebook and even below some Intel competitors - at least if they are not based on Intel's latest (ULV) Haswell architecture. 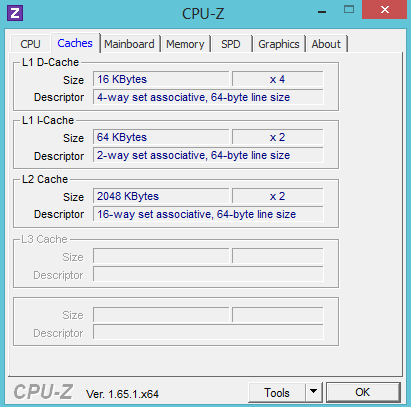 High load for processor and graphics card increases the consumption to a maximum of 45 up to 66 Watts. Considering the performance this is a reasonable result and no challenge for the provided 90-Watt power supply unit. 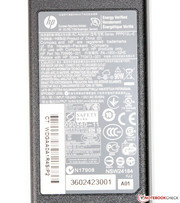 The Pavilion 15 does manage solid battery runtimes despite the comparatively average battery capacity of 47 Wh. Perfect conditions (minimum brightness, WLAN deactivated, energy-saving mode) result in 6 hours and 28 minutes in the Battery Eater Reader’s Test. 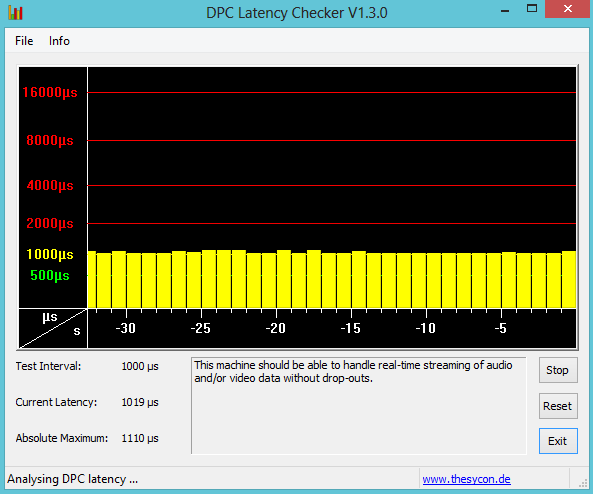 More realistic is our WLAN Test that simulates web browsing with an adjusted display brightness (around 150 cd/m²). 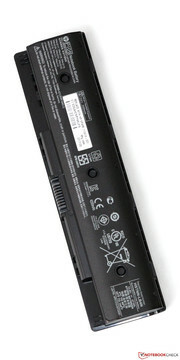 The notebook manages a good 4 hours and 13 minutes before the battery is empty. Even a longer movie is therefore no problem on battery power. Neither the CPU nor the GPU has reduced performance on battery power, so the runtimes in the Battery Eater Classic Test (maximum brightness, WLAN activated, high-performance profile) are comparatively short: The battery is empty after 51 minutes. The recharging is very fast with 80% capacity in less than 60 minutes. 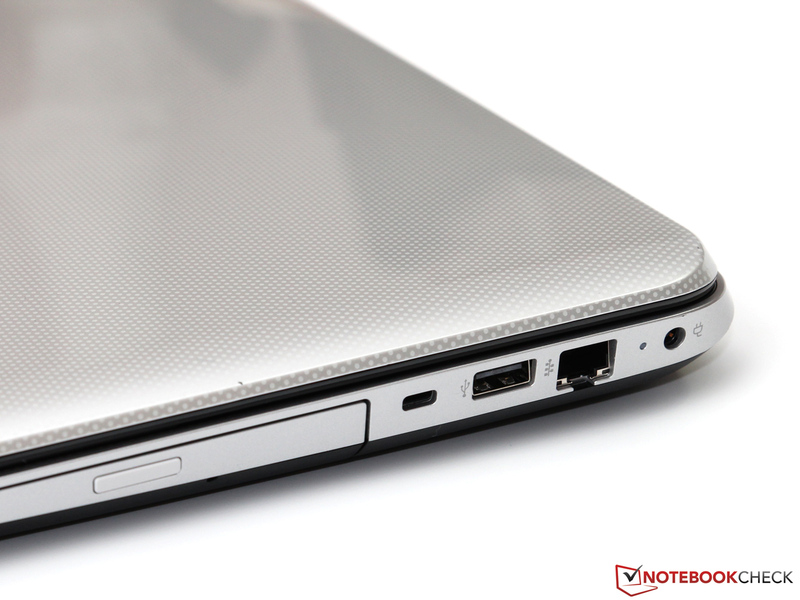 You cannot really expect a perfect product if you decide to buy a notebook for 500 Euros (~$663). Considering the price, HP does offer a well-balanced package with the Pavilion 15: Hardware equipment, application performance or battery runtimes do not have to hide behind the competition. There is also not much criticism in typical office categories like system noise, heat development and quality of input devices for this price range. However, we were not really overwhelmed by the limited viewing angles of the display and the plastic case, although these are not crucial drawbacks. 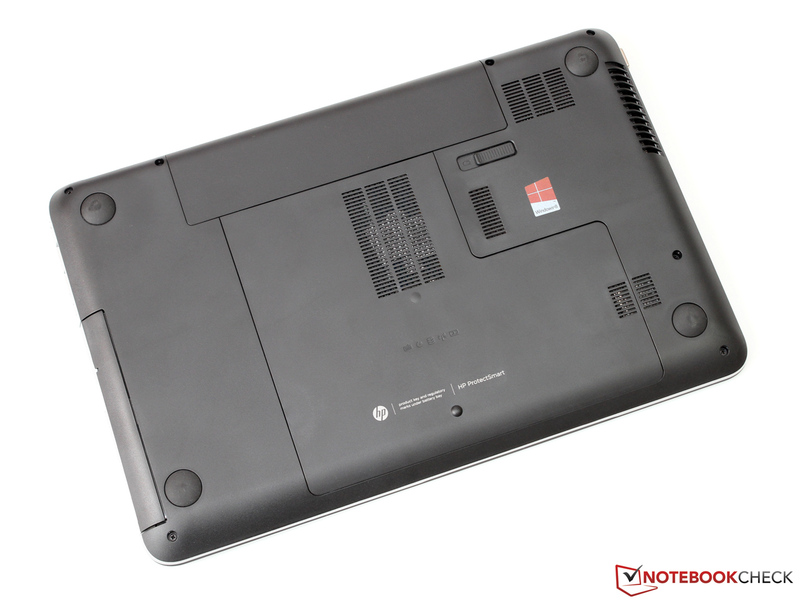 The real problem of the notebook is something else: It is HP's - and probably forced by AMD's product policy - decision to combine the powerful processor graphics with an additional dedicated GPU. Micro stutters and bad performance scaling are still a basic problem of this asynchronous Crossfire solution. The additional charge for the Radeon HD 8670M would have been better invested in other categories. 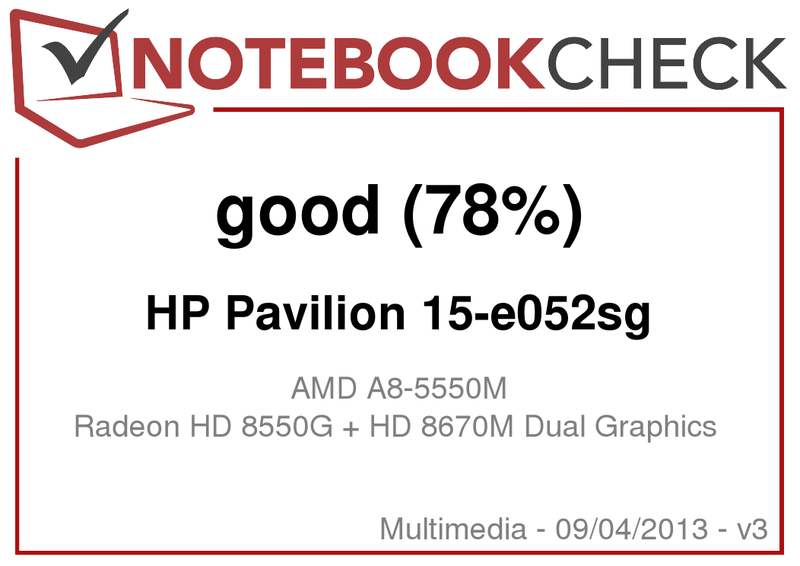 This is also the reason that we have a hard time giving an unqualified recommendation for the HP Pavilion 15. Especially since the market offers several attractive and similarly priced alternatives - some discontinued devices are even equipped with a Core i5 processor. ...on the back of the Pavilion 15. 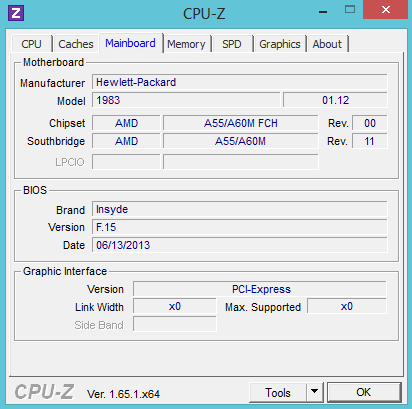 ...and is based on AMD's latest Richland platform. ...however, it comes with some problems. ...and the surface has a glossy finish. The overall quality impression is okay. 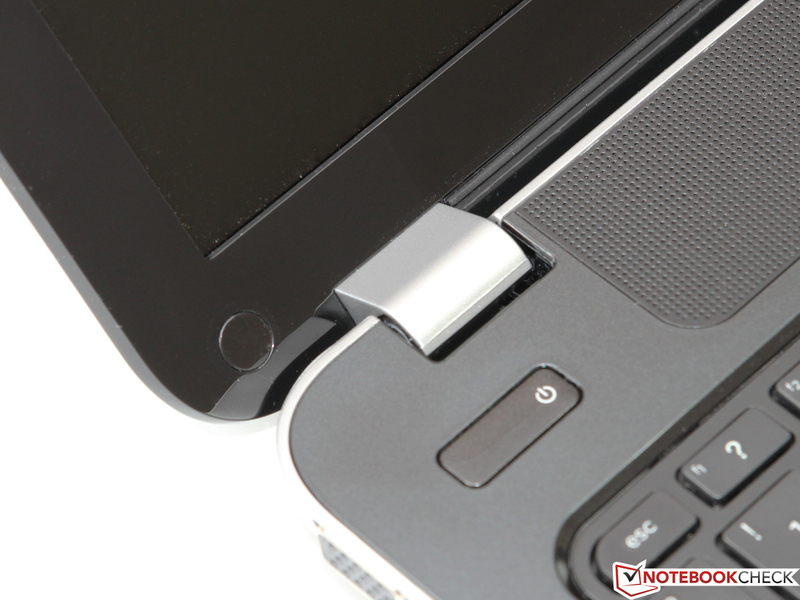 You do not have to waive USB 3.0. ... just like the Fast-Ethernet port. ...but the keyboard is well suited for typing. 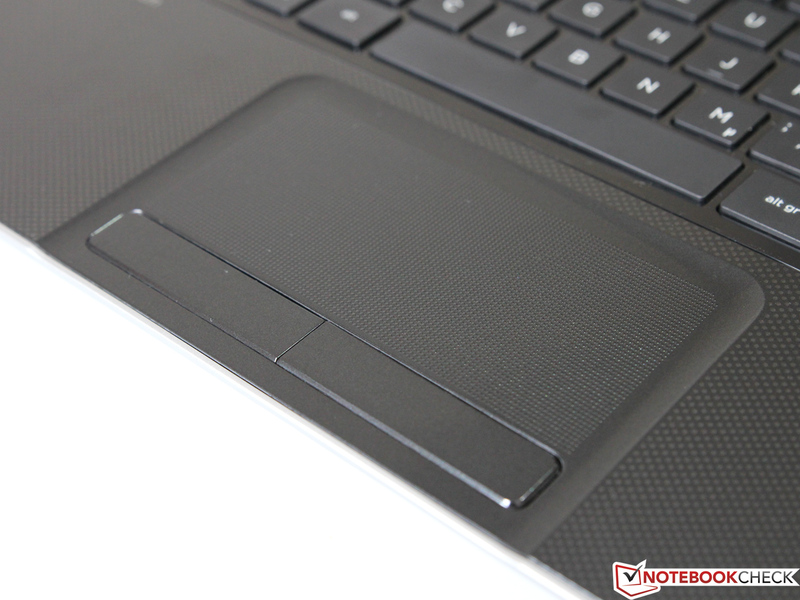 ...the conveniently structured and very precise touchpad. The integrated speakers could be more powerful. It can easily be removed. Battery runtimes of around 4 hours are realistic. The maintenance cover is secured by one screw. ...as well as the WLAN module. 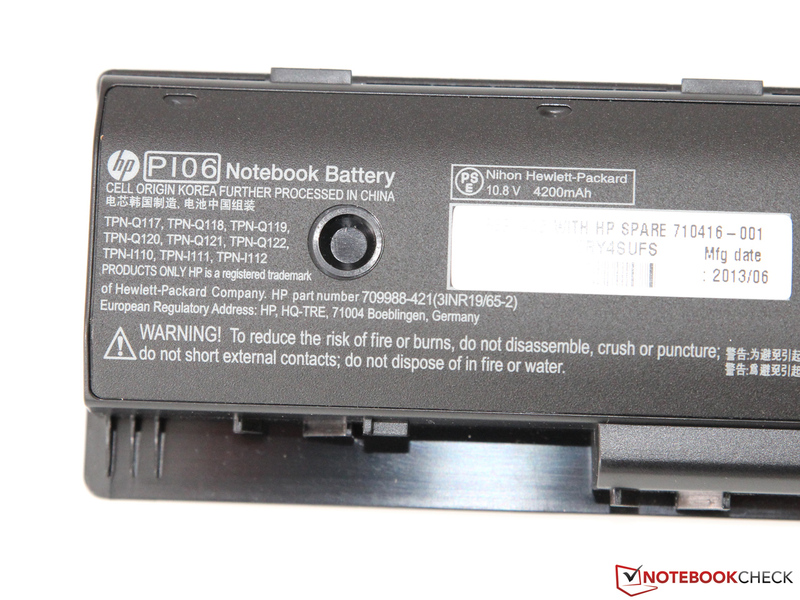 ...that has no problems with the energy consumption of the notebook. It does not always have to be an Intel CPU - AMD's latest products are also attractive products. The A8-5550M should have sufficient performance for most office and multimedia users. 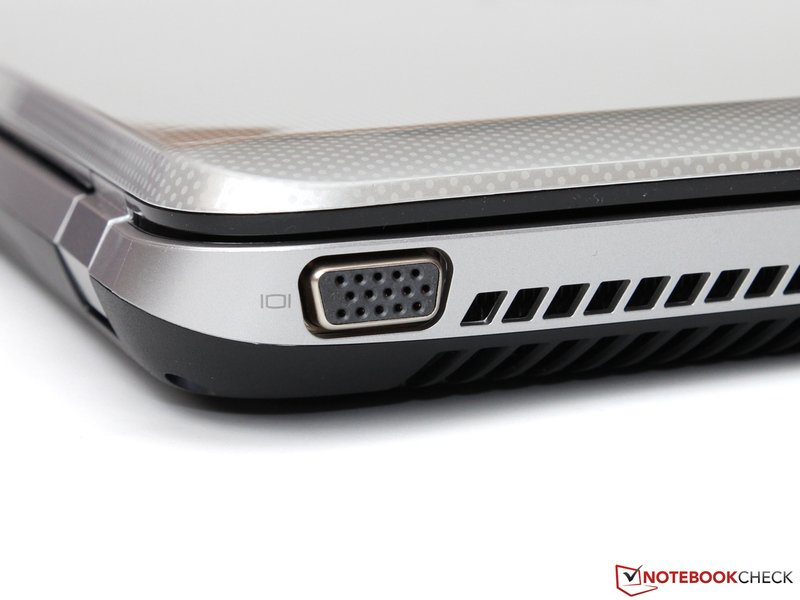 A DisplayPort and a fast Gbit-Ethernet port would really improve the port equipment of the notebook. Similar to the mediocre display, these are somewhat expected drawbacks for such an inexpensive notebook. Asynchronous multi GPU solutions, which also use the integrated GPU, have a huge performance potential. However, we cannot really recommend AMD's Dual Graphics in this current form - the drivers are still not sophisticated two years after the introduction. 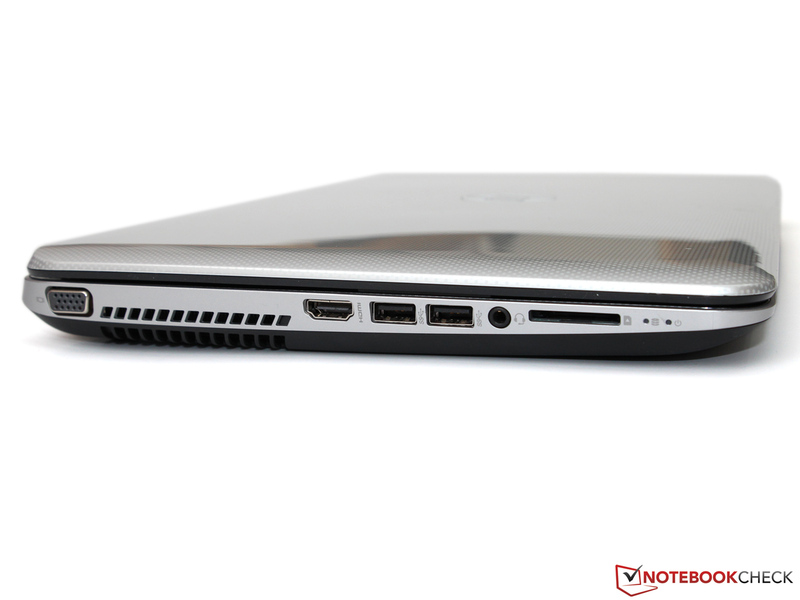 Besides some alternatives based on AMD chips like the Acer Aspire V3-551G, competitors are usually inexpensive Core i3 notebooks. 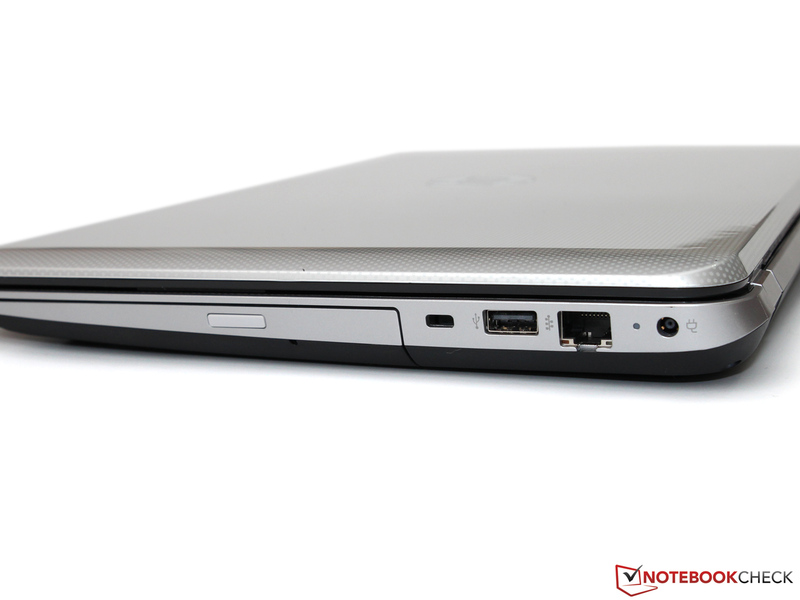 Among others this includes: Asus A56CB, Dell Inspiron 15, Packard Bell EasyNote TE11HC and Acer Aspire E1-571G.